With the acquisition of new artifacts and with more collectors contributing their artifacts to the Museum of Ancient Treasures (MOAT), the Museum was running out of room in the Garvey Center. For that reason, the Museum began searching for a new home. 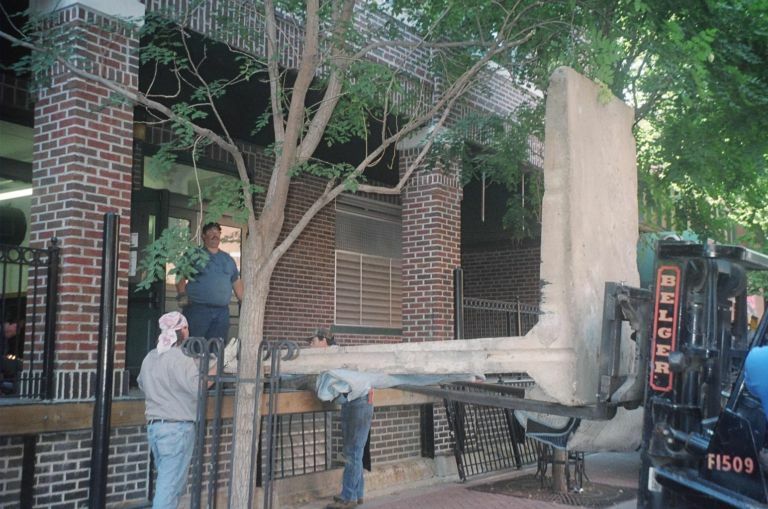 One was found in an old, city-owned building that used to house the Wichita Farm and Art Market. MOAT’S current building was constructed in 1914. It’s called the Johnson-Frazier building and it has gone through a number of modifications through its history. It was originally designed to be fire- and rodent-proof because it was a warehouse to store flammable materials, such as paper and paint. There was little internal structure to the building. 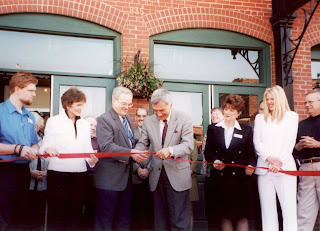 Several companies used the building over the years but a major changed occurred in 1993 when the building was renovated to house part of the Wichita Farm and Art Market. Several major changes were made to the building including: the front was moved to the north, the atrium was created by cutting away part of the second and third floors and the current elevator and central stairway were installed. The interior of the building was divided up and the individual spaces were rented out to shops, boutiques, and a bakery. There was even an art gallery on the third floor. With its individual shops, rooms, and large atrium, the Johnson-Frazier building was an ideal place for MOAT to move into. Not only that, three floors provided a lot of space into which the Museum could expand. Once the lease was approved, the Museum began the difficult but delightful task of moving to its new location. 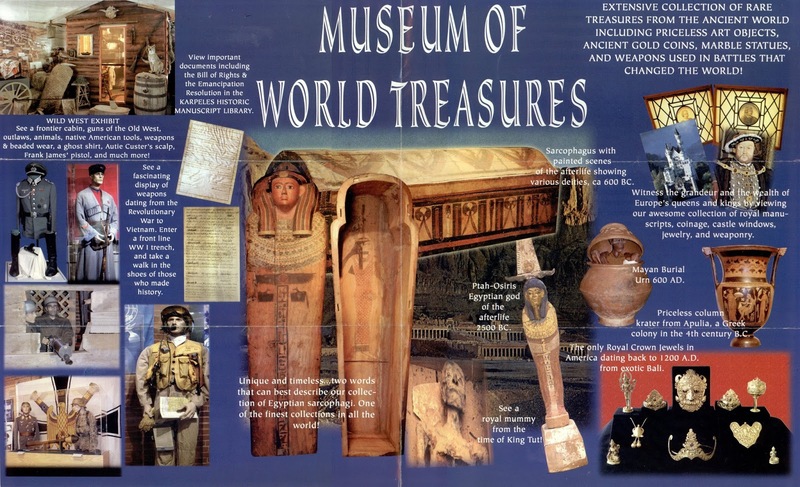 It was around this time that the Museum changed its name from Museum of Ancient Treasures to Museum of World Treasures (MOWT). It is unclear when the new name was first used. It was certainly used at the new building, which the Museum moved into in March of 2003. However, an amendment to the Articles of Incorporation made the name change official on June 30, 2003. There was an official ribbon cutting ceremony to open the Museum in the new building. A photograph of the event can be seen in Figure 2. Wichita’s mayor, Carlos Mayan, is seen cutting the ribbon. Even though MOWT now had significantly more space, it quickly filled it up. New dinosaur skeletons were added to its collection and displays. 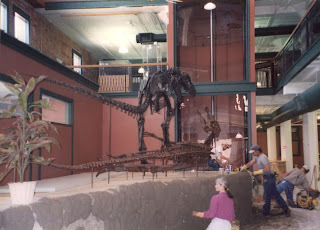 Figure 3 shows the Daspletosaurus and Edmontosaurus shortly after they were installed. Dr. Jon acquired the skeletons from Mike Triebold. Mike Triebold is the president of Triebold Paleontology, Inc., a commercial paleontology company that finds, excavates, prepares, sells, and installs fossils. After the dinosaurs were installed, the rock wall around their base was constructed, as seen in Figure 4. Another way the Museum filled up its space was by bringing several new collectors on board and having them contribute their collections to new exhibits. The majority of these new individuals collected military artifacts. There were at least twenty different collectors of military artifacts associated with the Museum and they all had a wealth of artifacts to contribute. In addition to simply providing artifacts, these collectors also designed and created exhibits. While the majority of the collectors associated with the Museum loaned their objects, some people decided to donate theirs. By the end of 2004, ninety-three objects had been donated to the Museum. These ranged from WWII photographs to Korean War Navy uniforms to Asian and Roman pieces to a large collection of Pre-Hispanic artifacts. Since the Museum exists as a non-profit, it functions for the good of the community. When the Museum owns artifacts, it holds them in trust for the public. In other words, when the Museum owns an artifact, it does not so much own the artifact itself as it takes care of the artifact for you, your children, and your children’s children. That is a huge responsibility that the Museum must carry. Owned artifacts represent the permanent heritage that will be kept by the Museum indefinitely. Loaned items can greatly enhance a museum’s collection or displays and the Museum must protect and preserve them like its own objects, but ultimately loaned objects are the property of organizations or people other than the Museum. While ninety-three artifacts is a lot, it is a small portion of all of the artifacts that were in MOWT in 2004: the majority of the objects were on loan from collectors. The collectors were responsible for which of their artifacts were displayed, how they were displayed, and what was said about them in their accompanying signs. In addition to building relationships with individual collectors, MOWT continued to build relationships with other institutions. One of these was the Wichita Sports Hall of Fame. 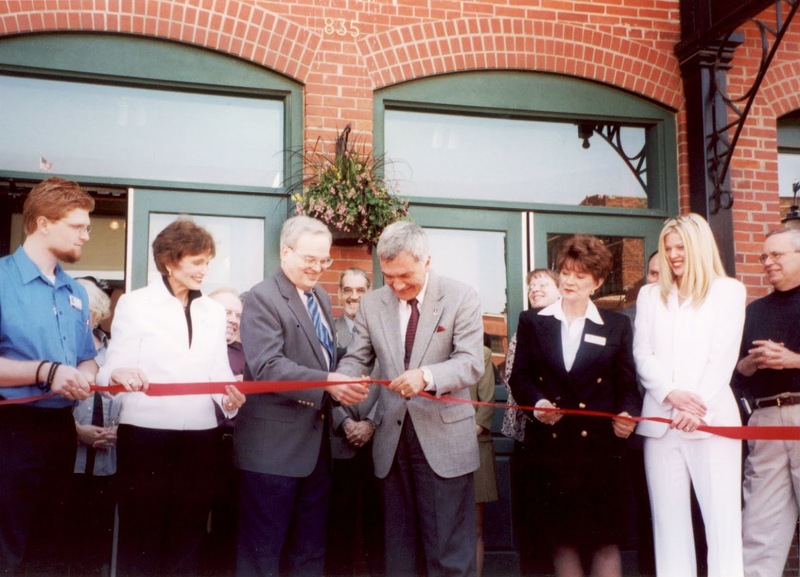 This organization was founded by Paul Savage in 2004 and that same year, it moved into the Johnson-Frazier building and became a part of the Museum of World Treasures. The Wichita Sports Hall of Fame occupied a portion of the third floor. 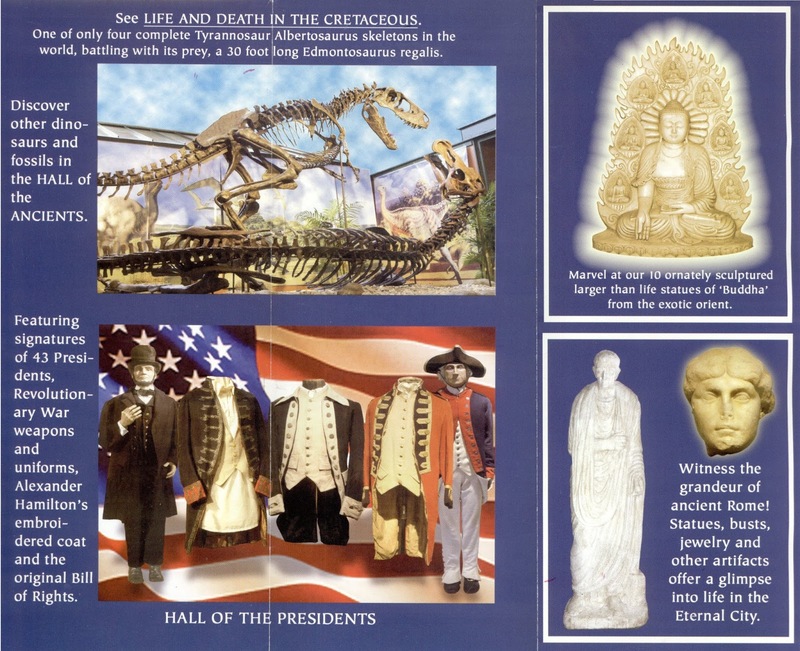 Having the Hall of Fame expanded the range of subjects in the Museum. 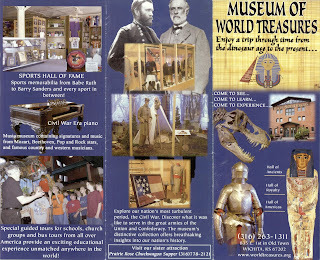 One of the earlier brochures for MOWT comes from 2004. Almost every exhibit in the Museum and many of the significant objects on display can be seen in the brochure. The brochure can be seen in Figures 7 – 9. This brochure is a fascinating glimpse into MOWT as it existed in 2004. 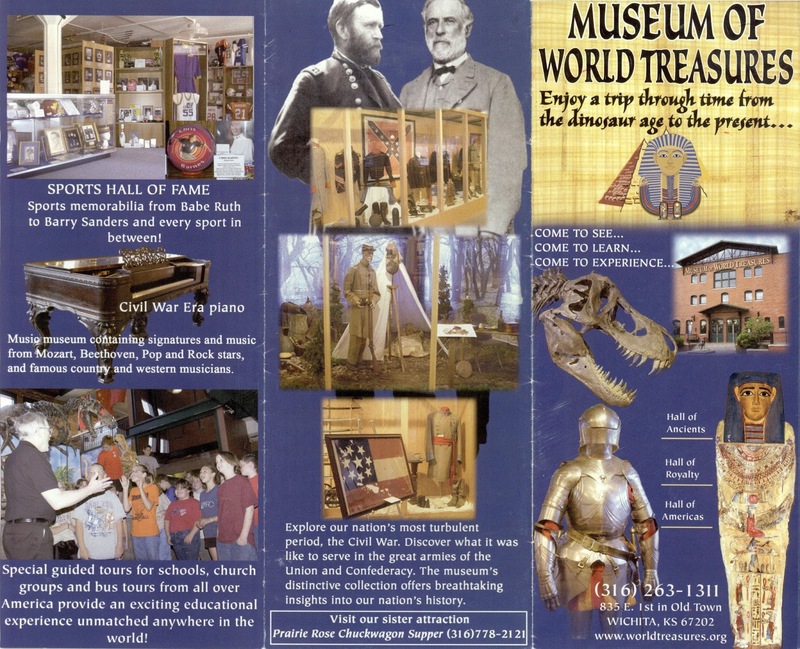 The brochure is an amazing look back at the Museum’s history. Notice that the logo, which can be seen in Figure 7, is a pharaoh mask in front of a pyramid. 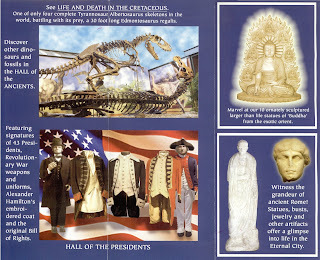 Dinosaurs, which are always a big draw, grace both the front of the brochure as well as the back (Figure 8). At the time, the Daspletosaurus was identified as an Albertosaurus. It was called an Albertosaurus until 2007, when a tyrannosaur expert visited the Museum and properly identified the specimen. The cast of Stan’s skull is shown on the front (Figure 7). Another significant artifact is the mention of a “royal mummy from the time of King Tut!” seen in Figure 9. This information is not accurate as neither of the mummies in MOWT have any connection to royalty. Baka is the smaller of the two mummies that can be seen in our Egyptian exhibit. The other mummy, the one we call Braided Haired Lady, came to the Museum in 2006. Note that many of the current exhibits exist in some form or other. The Wichita Sports Hall of Fame can be seen in Figure 7. 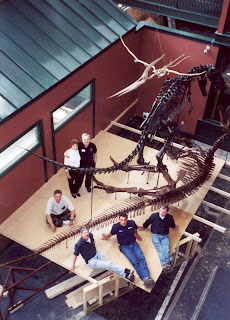 The Museum still focused on education and giving tours, as can be seen in the picture of Dr. Jon leading a tour in Figure 7. MOWT was starting to hit its stride, though there was still a lot of room for improvement. 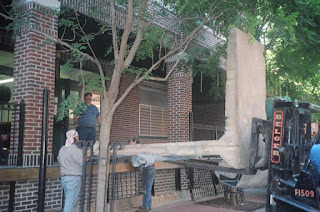 Moving the Berlin wall into the Museum was quite a chore. Figure 10 shows a forklift lifting the wall segment into the Museum. Note that some of the railing had to be removed in order to make way for the wall segment. Two forklifts were used: a large one, which can be seen lifting up the wall in Figure 10, and a smaller forklift, which can be seen raising up the wall in Figure 11. 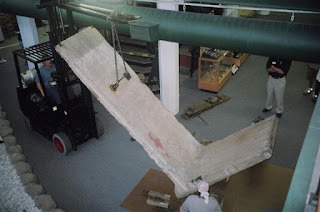 The Berlin wall segment was so heavy, the floor under it had to be reinforced with a column in the basement. Figure 12 shows the Berlin Wall exhibit as it originally appeared. “This is the second of four blog entries from guest author Steven King. Stay tuned for the rest in the series."